All necessary hardware included for easy installation. All Necessary Hardware Included For Easy Installation. These were manufactured to be used in the USA. Use outside of the USA at your own risk. For select 2011- Up Chrysler 300 vehicles. Installation Dash Kit for Single and Double DIN Headunits. Gapless fit between the dash and the kit. Painted to match factory dash color. Lower support bracket. • Double-DIN radio provision/single-DIN radio provision with pocket/ISO-DIN radio provision with pocket;• Matte black;• Includes OE bezel;• Fits Chrysler(R) 300/300C 2005-2007;. We're not responsible for typographical or illustrative errors. IN A 2002 thru 2005 DODGE RAM FULL-SIZE TRUCK. 75105-502 Dodge Ram Pickup - 1500 02-05 V UR F. Dodge Ram Pickup - 2500 03-05 V BR F. Dodge Ram Pickup - 3500 03-05 V UR F. iPod or other electronic device. Fuse Holders. Installation dash kit for Single or Double DIN Radios. Accommodates ISO Double DIN mount. Accommodates ISO Single DIN mount. Includes a storage pocket below the radio for single DIN mounting. Fuse Holders. - Factory Radio. Provides NAV outputs (Parking Brake, Reverse, Mute, V.S.S.). - Signal Processors. - Dash Kits. - Installation Harness. - OEM Harness. 1 x Axxess CHTO-01 Amplified Data Interface Harness for Select 2004-2009 Chrysler / Dodge / Jeep / Mitsubishi Vehicles. Fuse Holders. 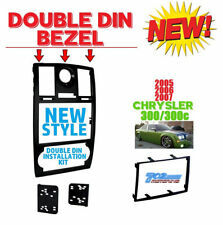 Single/Double DIN Dash Kit for 2011 - Up Chrysler 300 Vehicles. Designed and manufactured with precision tolerances. High-grade ABS plastic construction. Factory matched texture style. Fuse Holders. - Electric Guitars. - Wall Mount Brackets. - Wire Harnesses. Install dash kit for Single DIN/ISO Radios. Designed and manufactured with precision tolerances, resulting in a gapless fit between the dash and the kit. • Quick release, snap-in, ISO mount system with a custom trim ring;• Recessed DIN opening;• Built-in oversized storage pocket with built-in radio supports;• Contoured & textured to match factory dash;• Includes all necessary hardware;. Installation Kit '04-Up Chrysler/Dodge; A.I. Details about Enrock Audio Car / Marine 50 Foot Installation Speaker Wire. Details about Enrock Marine Single-DIN Car Boat Radio Dash Kit Protectors (Black / White). Let us know what you have in mind, and we'll speedily put it together and over get it to your doorstep at the most reasonable prices. DIRECTED DIGITAL SYSTEMS - THCHD3. • T-harness for 3rd-generation Chrysler(R) DBALL/DBALL2 2013-2014 ;• 8-pin-style vehicle harness connector;. RV Audio Systems (71). Details about Enrock Audio Car / Marine 50 Foot Installation Speaker Wire. 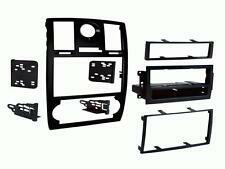 Single/Double DIN Mounting Kit w/ OEM Bezel for 2005-07 Chrysler 300 Vehicles. 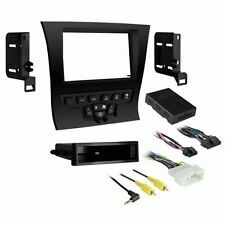 Installation dash kit for Single or Double DIN Radios. Includes a storage pocket below the radio for single DIN mounting. 1DIN radio Facia Panel. 1DIN mounting plates. 2DIN radio bracket. 2DIN Radio Facia Panel. 2DIN mounting plates. Optimal fit for the installation kit in the console / dashboard. CD Receiver / Player / Tuner. 2007 Chrysler Sebring, Dodge Nitro, Jeep Wrangler. Radio Installation Kits. Amplifier Install Kit. DIN or ISO mount kit with pocket. Self installation voids the warranty if any. We may require receipt of professional installation/bench Test report to establish it was professionally installed and the issue was with the product and not installation. When you need to install a double-DIN radio or single-DIN radio with a pocket in the dash of your vehicle, this stereo dash kit is what the doctor ordered. Made of premium quality ABS plastic. Installation dash kit for Single or Double DIN Radios.